Kiril Mugerman, president and CEO of GeoMegA Resources, explains how recycling is reshaping the rare earths sector and why investors should look to rare earths juniors. At this year’s Mines and Money Americas conference in Toronto, the Investing News Network had the chance to talk to Kiril Mugerman, president and CEO of GeoMegA Resources (TSXV:GMA), a rare earths-focused company that has created a unique way of recovering rare earths through recycling. Based in Quebec, GeoMegA is positioning itself as rare earth oxide producer able to supply materials integral to the high-strength magnets used in wind turbines, electric vehicles and refrigeration systems. The recycling process created by GeoMegA harnesses the small amounts of rare earths left over in the manufacturing process, which means fewer new materials need to be mined. Using waste from production reuses valuable materials, and has created an environmentally friendly way to produce rare earths. Watch the interview above or read the transcript below for more insight from Mugerman, including his outlook on supply and demand dynamics in the rare earths sector. You can also click here to view our full Mines and Money Americas interview playlist on YouTube. INN: GeoMegA is a little different than traditional rare earths companies. Could you explain to us a little bit about your company? KM: GeoMegA started as a traditional exploration company looking for rare earth deposits in Canada. Over the years, let’s say mostly starting from 2013, 2014, we started looking at the main problem of the industry, which is the bottleneck in rare earth processing, rare earth refining. We started looking at innovative technologies — how to get the biggest problem of that industry, which is solvent extraction, solved by bringing a technology here into Canada and being able to process rare earths here without having to send all our concentrates to China. INN: Now, you mentioned leveraging technology. How is GeoMegA using technology to its advantage? KM: We started developing the technology here starting from very small scales, and we said, “you need to be very careful, it’s a very difficult task.” I mean, refining rare earth elements, separating them is one of the most complex chemical processes in the world. So our idea was we’ll have our own technology and that will help us build the mine. The current leverage really came from when we started developing this technology, we said, “look, we don’t want to have a black box that nobody knows how it works.” And for that, we’ll need to raise hundreds of millions of dollars to build a mine. Instead, we started going towards, “let’s prove that it works by processing existing feeds.” And the best existing feed is an industrial residue which is coming from the main application of rare earths, which is permanent magnets. We realized that by doing that we could demonstrate through a full commercial plant that rare earths processing can be done here using our technology, which does not use organic solvents — done in an economic and competitive way to that in China and generate cashflows. And with this then we can build our own mine, we can build a larger plant to process concentrates from other mines. So it’s really — that is our leverage. We’ll have our own processing facility with the technology that works, with a cashflow coming from that facility. INN: How have you seen demand change since you’ve been in this sector? KM: I started my career in the sector in 2011, following rare earths. And that was a good time to see the bubble form. It was a very strong geopolitical risk globally. We saw China restricting exports to Japan, and that created an environment where pricing increased significantly. I believe we went from around US$40 or US$50 per kilogram of neodymium to well over US$500 per kilogram, and some elements went to US$1,000+ per kilogram. It was very difficult for end users to start, to continue their development of their products using this pricing, so we saw a lot of engineering applications, engineering developments to engineer out those rare earths. That started hurting some of the demand, but then when we realized that it was a bubble — well not we, but when the market realized it was a bubble and the pricing started dropping — then the traditional usages came back, and the biggest one is magnets. And we see magnets being applied today to everything. I mean, our power tools, if you think about 10 years ago, 2008, we were just starting to use our regular power tools, cordless. It came at the same time with our developments to the batteries. Batteries started getting better, as well as the motor within the power tool. But the main applications that we see today that are driving the demand is actually electric vehicles and renewable energies. So the electric vehicle in 2008, we were just starting. We had a bunch of hybrids on the roads. Electric vehicles were still very rare and few. Even Tesla (NASDAQ:TSLA) was operating several electric vehicle models at that time that were running an induction motor. They were not using permanent magnets. But now we have so many companies that are making electric vehicles, more and more hybrid vehicles. In China, just there we have so many companies that are making electric vehicles that we don’t even have access to here. So all that is demand. Then the renewable energy is a completely different sector. I mean, if we consider the wind turbines that were built 20 years ago, they barely had any rare earths. They were not very economic, they were very big, very expensive to build. Today we build huge farms of wind power and it’s generating a lot of electricity and suddenly it is economic. And we know that demand is real. INN: Do you see demand growing in Q4 and 2019? KM: Absolutely. The demand’s been constantly growing, and we are in touch with the magnet manufacturers in China, and we see from their numbers that the demand is actually growing. It’s a cyclical industry like most industries, so there are quiet periods during the year. They saw that this year the price remained very stable throughout the year, which is very positive because usually there is a drop during the year. And this year if you look at NdPr pricing, it stayed very stable around US$60 per kilo. So that’s a good indicator for the Chinese magnet manufacturers that the demand is growing. INN: China produces 90 percent of the world’s rare earths. Do you see another nation stepping up and maybe competing with China in the near future? KM: China has the biggest capacity for rare earths refining, the solvent extraction capacity, and it’s very hard to compete with that. I mean, we know that Lynas (ASX:LYC) built one facility that became the main source outside of China. We’ve seen some news recently that they are having some permitting issues with the government, so we don’t know exactly what will happen there. So it will be sad to see one of the only facilities that got built outside of China — if they have issues to continue operating there. It’s hard to say right now at the current pricing environment if any other company will be able to start building a mine and producing rare earths because at the end of the day, if you’re doing that you have to build as well the refining capacity. Now, if you’re making just a concentrate and you’re shipping it to China, even though you’re producing the concentrate the rare earths are still going to China. And that’s what we are trying to change. Our capacity to process rare earths is actually to try and bring the purified refined oxide outside of China. INN: Earlier this year, the US government announced that rare earths were going to be added to the critical materials list. Will this benefit your company? KM: I think it’s — I mean, we’ve seen several governments over the years announce and they put the importance on rare earths. And absolutely, I think it just puts an extra emphasis on the potential increase in pricing that most likely we’ll see over the next few years. The applications are growing. I mean, if you look at refrigeration, refrigeration is using more and more magnets. Everywhere where we have an electric motor, they’re using more magnets. And that magnet is actually very important for us because what we are trying to do is we are not starting in mining anytime soon. Our focus is demonstrating the technology works, and as I mentioned to you earlier we want to demonstrate that it works through an industrial residue which comes straight from the magnet. I’ve got an example here for you here where we literally take a magnet that’s produced as a waste. Sorry, I’ll take that back. The magnet manufacturer produces a waste when they make a magnet and on average we are looking at 10 percent waste, but it can go to much higher than that. So when you take that waste, you can process it and make rare earth oxides out of it. So here we have an example of 99.5-percent neodymium oxide and 99.5-percent dysprosium oxide that is produced from that waste. This is a very important source of material for us. And if in the past you had to start the mine, today to demonstrate that our technology works you don’t need to start the mine. We are starting to work on this, producing more and more. We scaled up over the last four years, five years, from our initial processing capacity, which was an extremely small separation chamber of 30 milliliters. Then we went to 50, then we went to 2,500 milliliters and today we are 20 liters and we are targeting next year a 200-liter capacity. And the idea is every year we are trying to increase the scale times 10, but at the same time we are as well increasing the concentration that our technology works in. This has been the incredible growth in this technology. The scale and the concentration. Both together we were able to demonstrate and to convince ourselves that this can be economical, and that’s what we are focusing on. Here, I just have a little bit of waste from the process which is iron ore — not iron ore, iron oxide. And even with this you will produce a little bit of cobalt sulfate because within every magnet, there is a bit of cobalt, which is very important as well to the battery industry. INN: Are you able to use these again? Can you sell these too? KM: So there’s definitely a value in cobalt that you can sell. There’s very little value in the iron oxide, just because iron oxide, iron is sold at US$60 a tone. So you do have to produce a lot of that to get US$60. So the main application of this will be just to pass it on to another company that can use it for something, but without necessarily recovering the cost. For cobalt, you can definitely get some value, but most of the value will be sitting with neodymium and dysprosium or with praseodymium or with terbium. There are usually up to four elements that go to make a magnet. So when we take the waste from the magnet, we’ll have exactly those elements here after it’s separated. Those elements are very important because they’ll go back to the manufacturers of metal, they will go back to into the magnet manufacturer. INN: So this is essentially a green process for rare earths? KM: Absolutely. I mean, some people are asking me the question, “how come it took so long?” Well first of all, it’s a very complex process. To separate rare earths, there aren’t that many alternatives. Second of all, we wanted to make sure we are not using any organic solvents. We want to get rid of that pollutant from this process. The third reason is we actually wanted to make sure that all the reagents that we used we can recover. Because if you constantly have to buy more and more reagents, and it’s all going to the environment. Even though it’s aqueous chemistry we still have to process it and then if we have to process it, there’s an extra cost. Today, we demonstrated that we can recover well over 90 percent of those reagents. They are very important for us because if we can recover them, we can reuse them again. It’s not only about cutting the cost on disposing. It’s definitely a clean technology. And because it’s clean technology, as well as it’s important for us to focus on the circular industry that we form within rare earths. And if you’ll look at it, I started technology here and you do have the mining aspect that will be providing concentrates, but as well we work together with the rest of the industry, which is the metal manufacturers. They make a metal that goes to the magnet manufacturers. They produce waste. We can process that waste. They produce waste and we can process that waste. And then the magnet goes through its lifetime and gets recycled. And more and more we see this recycling happening and that final magnet still makes it back to us. So this is the circular industry that we are living in, and we are trying to maximize it without having to always go back to the mine. 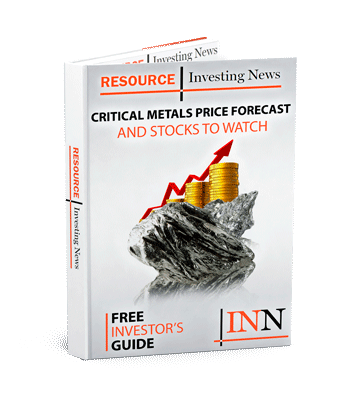 INN: Wrapping up, why should investors be excited about rare earths? KM: Electric vehicles depend on two things: they depend on the battery, they depend on the motor. Without a good electric motor, you won’t have an electric vehicle. We went through the last 10 years of yes, we’ve had a price increase in rare earths, but that was not real at that time. Since then, we had a huge spike in graphite pricing, which was for the battery. We went through a spike in lithium pricing, which is for the battery. We went through a spike in cobalt pricing, which is for the battery. I think the rare earths are coming. The US government is having a trade dispute with China, which is not helping the industry, but at the same time it is helping the industry because of that criticality of rare earths. We’ll see a price increase. I think it’s only a question of time before we realize that there is just not enough neodymium that we can produce from the existing mines. Or to produce it, we have to mine so much other elements, which there is just not enough demand for them. We will be seeing an increase in pricing for neodymium and dysprosium. I think that’s why the investors should really start paying attention to what is next. I mean, we saw all those other elements, I think the rare earths are next. And I think, really, investors should be starting to take a position in rare earth juniors.